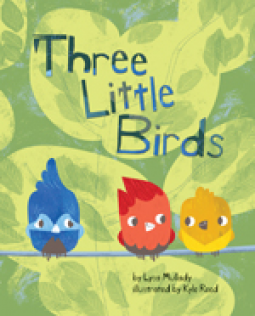 A little birdie taught me: Three Little Birds – Joyce's mystery and fiction book reviews with some non-fiction too! This is another entry in the series of children’s books that is published in conjunction with the American Psychological Association. Each title gently teaches young children how to manage their world. In this picture book, Blue is upset when Red and Yellow fly off without him. In his upset, Blue starts a rumor that is spread by birds of many colors. (A side benefit of the book is that children can show off their ability to identify the colors.) Eventually all is resolved. Blue apologizes for his lie while Red and Yellow acknowledge that they should have invited Red to come along. The birds of every color are together in harmony. At the conclusion of the story, there is a section for caregivers on how to help children to deal with similar situations. This adds extra value to the book. Thanks to NetGalley and the publisher for this book that belongs on nursery and day care bookshelves. ← An amusing way for young children to learn manners: How Rude!